Sacchetto means small bag in italian and refers to how the construction is put together. 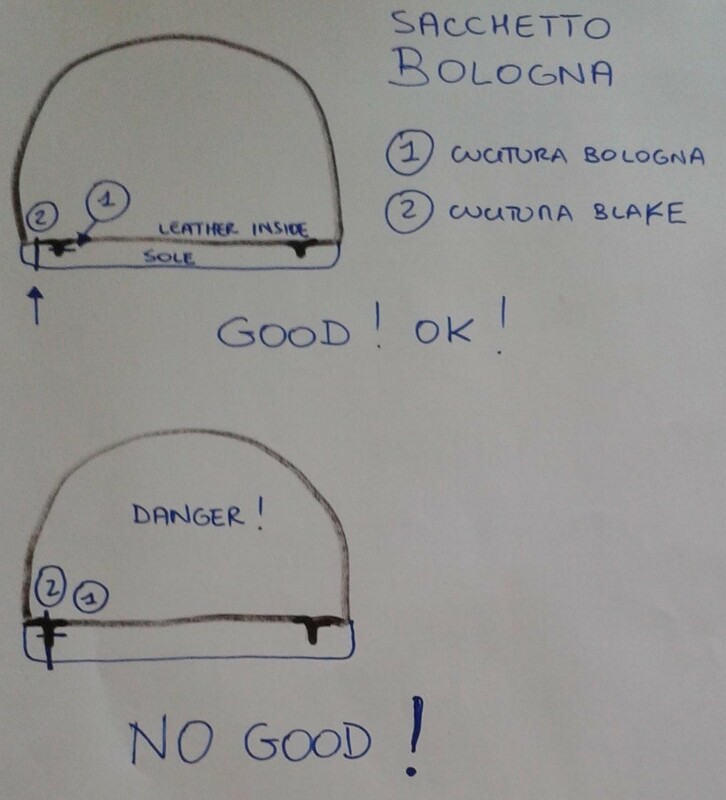 The Bologna construction creates a very soft and flexible construction. Normally it´s used for products where a light aesthetic is preferred such as ladies ballet flats but can be used for a wide variety of products. Lately it's become more popular also to use for men's dressed shoes. Bologna construction is considered to be a construction of comfort since it creates highly flexible and soft shoes with few stitchings inside. It also has a neat appearance which allows for a thin outsole with outsole edge close cut to upper. Bologna construction is sometimes confused with Moccasin construction (read more about it here). Apart from Bologna or Sacchetto construction it can also be referred to as Glove, Tubular or Bag construction. The upper is stitched like a bag, then turned inside-out. Then a last is put inside of the “bag” where the material is tightly wrapped around it. With one stitching the upper is tightly secured and the last is removed. The outsole is attached with a blake stitch through the outsole and the bottom of the upper together with lining. The blake stitching will be the only stitching present inside the shoe and will be positioned closely to the upper walls. Compared with the blake construction the stitchings are closer to the upper/lining edge since the outsole bond is solely secured by stitches, not cement. With a stitch closer to the edges it's not noticeable when wearing which increases the comfort level. A footbed is sometimes also added to create an wedge or to add comfort foam.. Same as with the blake construction the outsole can be close cut to the edge of the upper, creating a very neat look. The blake stitchings are exposed on the bottom of the outsole but can be in a stitching channel to protect from wear. Since the threads run through the outsole, upper and lining the wet resistance is low. 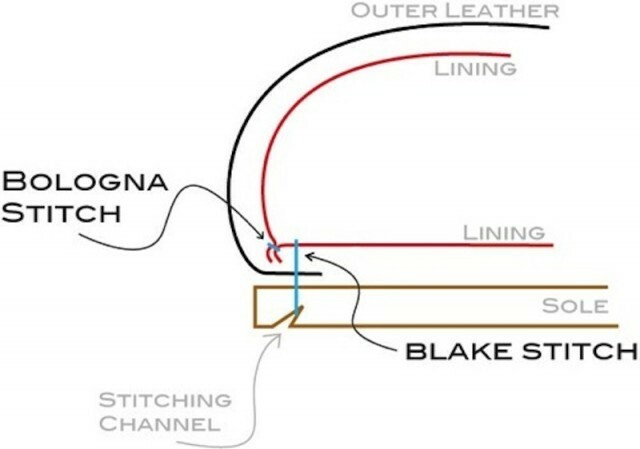 To ensure best durability the stitch location of the blake stitch should not cross the bologna stitch as it will make the construction weaker. Explanation of preferred stitch location. Credit Stefano Ferioli.